Heather Hoch The Indian taco at Manna from Heaven wraps common taco filling inside a freshly cooked frybread. Open: Tuesday-Saturday: 11 a.m.- 8 p.m. When I was a wee lass, I remember going to the county fair and, aside from the prospect of being pinned to the walls via centrifugal force on the Gravitron, I always looked forward to a piping hot elephant ear. What I didn't know at the time is those sweetened circles of fried dough with a cute mammalian name actually have a history away from carnival games and rides. Kind of like learning Columbus Day is actually a holiday that honors a sadistic genocidal maniac, learning the history of frybread isn't exactly easy to hear. According to the Smithsonian Magazine, the first instances of frybread pop up over 150 years ago in Arizona when the Navajo were forced to relocate to New Mexico. Since the 300-mile trek, dubbed the "Long Walk," didn't allow for the nation's traditional, perishable meal staples (vegetables and beans), the U.S. government kindly offered up canned goods, white flour, processed sugar and lard for their trip. These meager and completely unhealthy government rations became frybread and, while the dish serves as a reminder of that awful event in U.S. history, it also speaks to the resilience of the Navajo people under oppressive, foreign conditions. Over in Barrio Hollywood, Manna From Heaven offers dorados (fried tacos) and burros, but the focus at this small restaurant is definitely the frybread. The highly religious name (manna was the divine food stuff that satiated the Israelites in bread form as they wander the desert) carries through to the restaurant's décor and social media presence. Both offer quotes from the Bible. Aside from that, the restaurant is simple and relatively plain with a few tables inside and a few more out back. The menu here is pretty basic as well: green chile, red chile, beans, Indian taco-style or with sweets. Really, you don't need much more than that. Prices range from $3 to $7.50, with chile topped frybread priced the highest and cinnamon, honey or powdered sugar topped frybread being the cheapest. While $7.50 is a pretty penny to pay for fried dough, the quality and execution justifies the expense in this instance. Plus, the price was initially $8.50, so clearly the spot has taken some cues from customers. 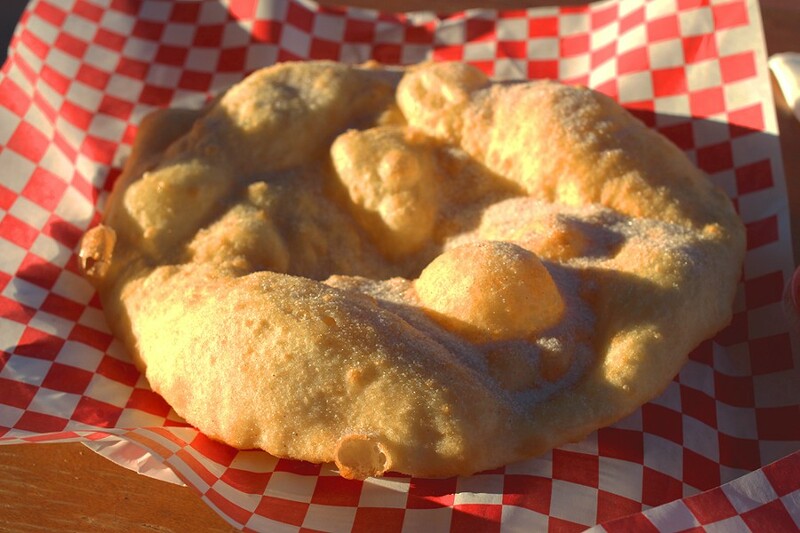 Regardless of your chosen topping, sweet or savory, the frybread that comes out is consistently satisfying. You can peek into the kitchen next to the register and see frybread pulled into eight-inch circles and tossed into oil. When they come out, they're covered in bubbly, greasy pockets of dough, crispy towards the middle and doughy and tender on the outer edges. That crispier middle ensures the frybread can stand up to a healthy helping of beans or chile. While the smooth refried beans are pretty much the food equivalent of a hug from your mom, the red chile offers a smoky, salty and slightly spicy dose of slow-cooked and tender meat. However, the green chile, which is slightly lighter and, well, greener in flavor, is the real star here. Should you need something a little more substantial, you can add beans or cheese as well, though the serving of chile is generous on its own. 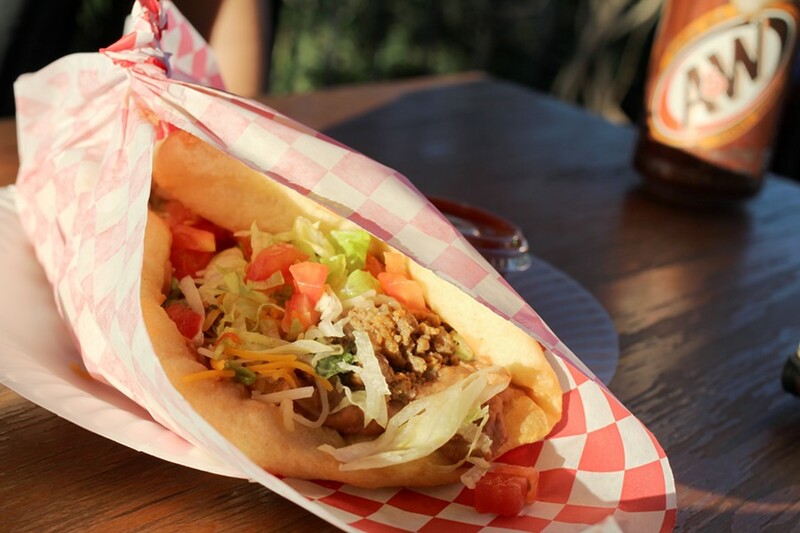 You can also opt to get your frybread in taco form with beans, cheese, lettuce, tomatoes and seasoned ground beef ($7), which, on Wednesday, comes with a drink as a combo for $5.50. Drink options offer cans of soda or bottles of Jarritos and orange Crush for an additional dollar. Dorados, filled with beef, lettuce and more, offer a cheap and crunchy option for just $2 per. While the modest menu is executed well, if there's anything to steer clear of at this little frybread joint, it's the burros. That's not because the chile or tortillas are bad in any way, it's just that $7 for a red chile burro is a little pricey when compared to other places like Anita's Street Market, which offers the same burro for under $5. No matter what combination of wheaty base and meaty embellishment you choose, you'll likely find yourself smothering your food in the house salsa. The fresh, flavorful blended condiment is not just devilishly spicy, it also retains a bright, veggie quality from its ingredients, rather than being loaded with vinegar as is the case with many taqueria salsas in town. It's the kind of salsa that's addictingly hot, leaving you unable to stop pouring it on your frybread until you've obtained a reasonable spice high. Unless, of course, you chose to go for one of the three sweet options, of which the cinnamon sugar is my favorite. Best of all, the staff is friendly and food comes out quickly. An employee brought out my order towards closing time on one visit, and although she said she's working two jobs and going to school full-time, she was smiling and joking and the frybread she made moments before was darn near immaculate. For a Biblically named restaurant, this west side joint has some serious soul. The eats are the very definition of comfort food and I have a feeling you'll likely make return visits after your first stop in.